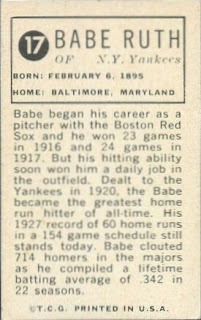 Topps doesn't have any New Year's themed sets, otherwise I'd probably be posting about such a thing but as we start our ninth (!) 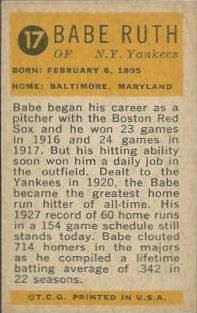 calendar year here, I'm going to turn the WABAC to 1963 and take a quick look at the Bazooka All Time Greats set. I did a short post a while ago on these but want to take a closer look at the "silver" variations that are circulating. Besides, I'm on a bit of a Bazooka research bender these days. 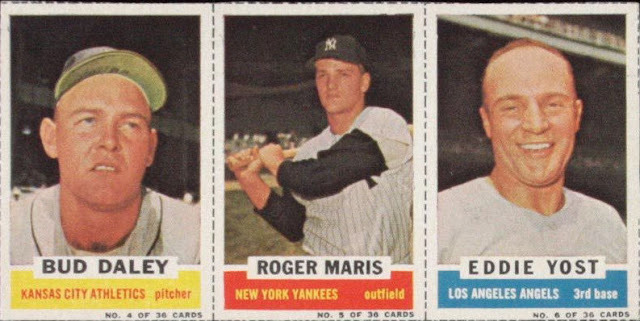 Topps may have thought 1963 would be another year where Fleer issued an old timer's set, as they had for three seasons, but Fleer elected to try a set of current major leaguers, which Topps shut down after one series. The 1963 Topps regular issue only had a single insert, 46 Peel-Offs that would hardly have filled out all seven series of cards while they were competing with Fleer so it's a bit odd their other insert set went into Bazooka boxes destined for the nation's supermarket and variety store shelves. 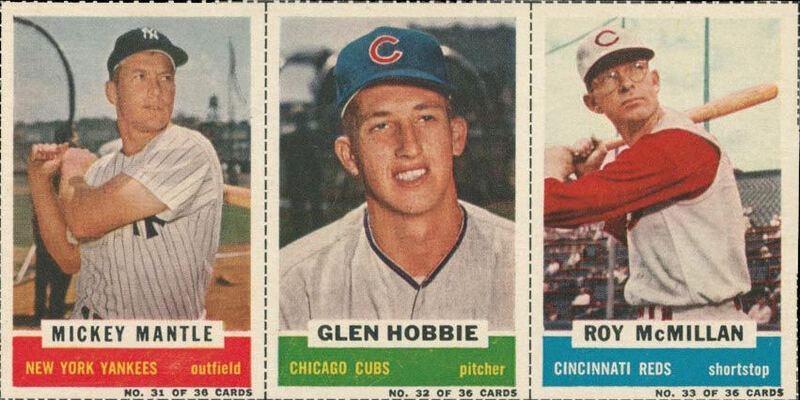 I have to suspect the timing was such that after shutting down Fleer they decided to just put the All Time Greats, which feature T.C.G. indicia, into Bazooka, which already featured what was becoming a standard three card panel of current players. Clearly these were intended to be manufactured just a little differently. So what's the story? 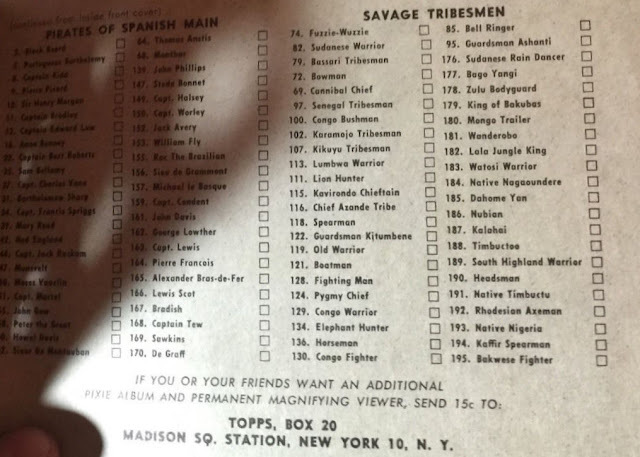 Some sources I've seen say the silver cards were issued in larger than ordinary Bazooka boxes (normally they were either 20 or 25 count) of 100 pieces or so, while others offer no opinion at all. 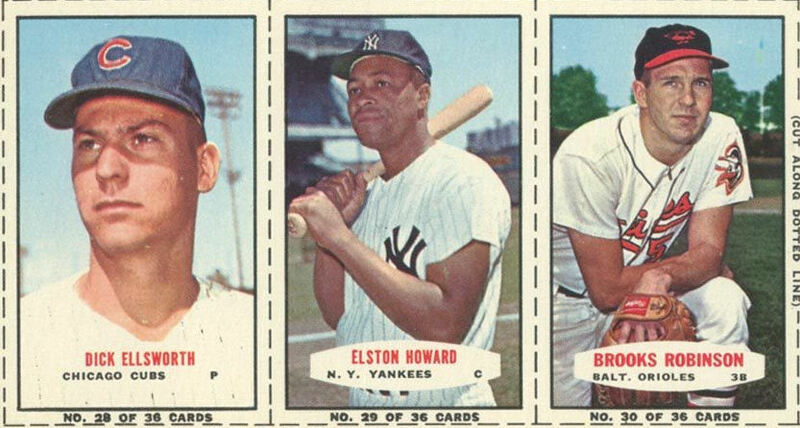 What I can tell you is that the November 3, 1963 Fifth Catalog Additions to the American Card Catalog mention both the gold and black-and-white backs so they were both produced in or by 1963. The 20 and 25 count boxes both state there were 5 Golden Edition" cards in each box. 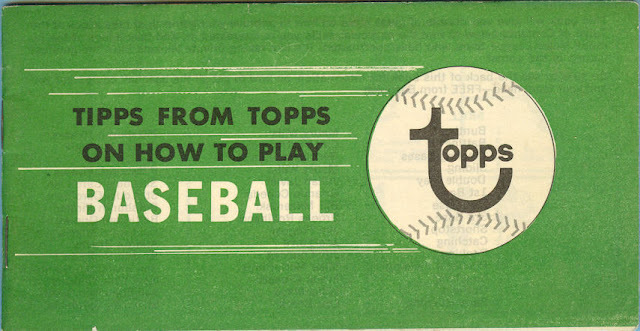 My best guess is that Topps had a final run printed up, awaiting the golden touches and then just used the cards anyway to finish out the 1963 Bazooka baseball issue. 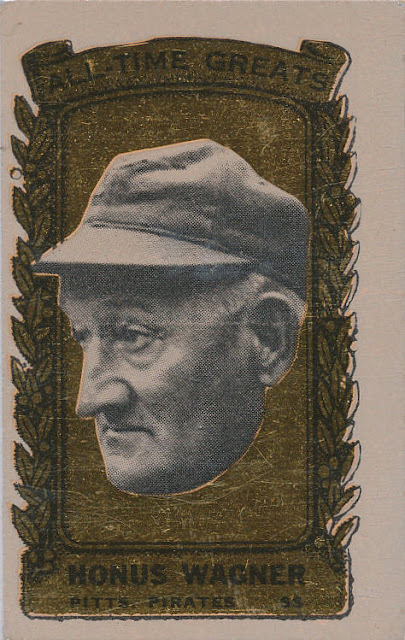 They are about three or four times scarcer than the gold cards but not particularly hard to find so some fairly large distribution of them occurred. Here is the "Golden Edition" checklist, see you all in 2017! Christmas Eve once again kids, time for Santa to come down the chimney and have a snack! 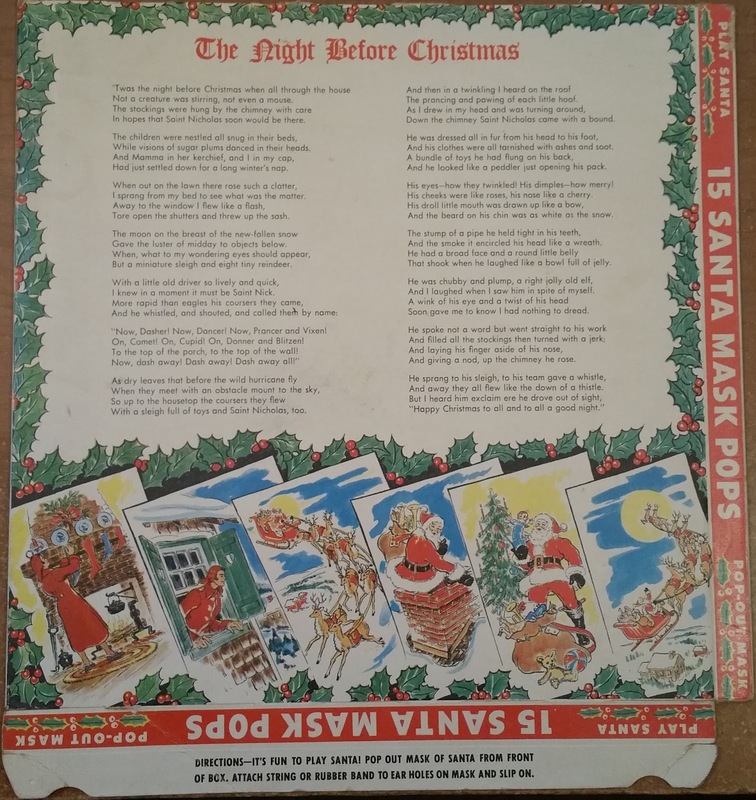 I don't always link the blog posts here with holidays but it's just too coincidental this year to avoid. Topps, in their early days, worked with a couple of greeting card manufacturers from about 1948-50 to attach Topps Gum and some later penny tabs such as Varsity to various greeting cards, including Christmas themed ones, before they fully switched over to Bazooka bubble gum. 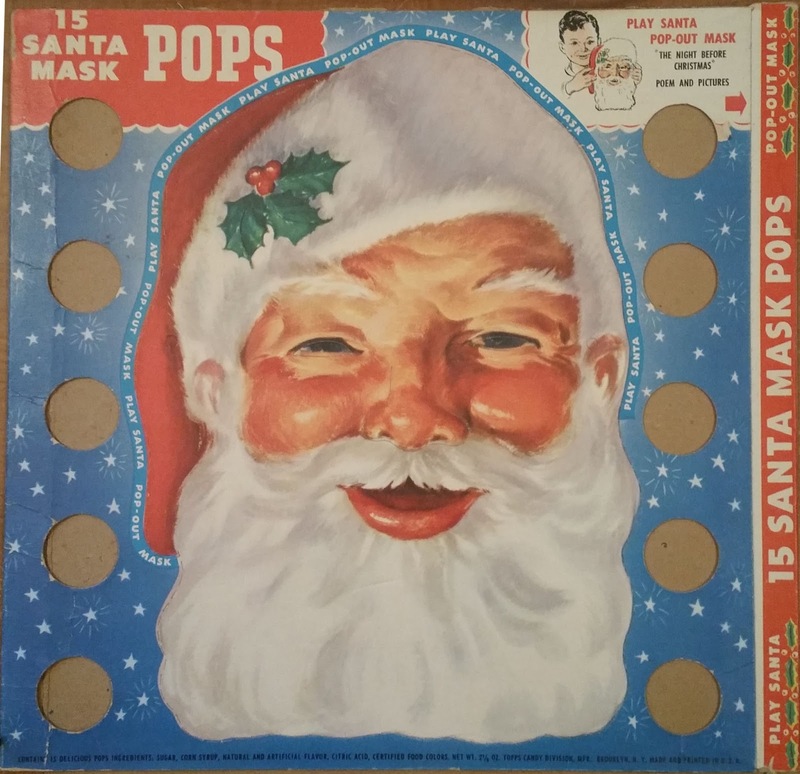 Following that they then tried a few lollipop filled Yuletide products from about 1950-51 featuring Santa and Rudolph but those didn't really outlast their standalone Candy Division from what I cna tell, which was shut down circa early 1952 or so. I'm still not sure if the different backs (there are at least two) mean Santa Pops came out in multiple years but my best guess on date is 1951. 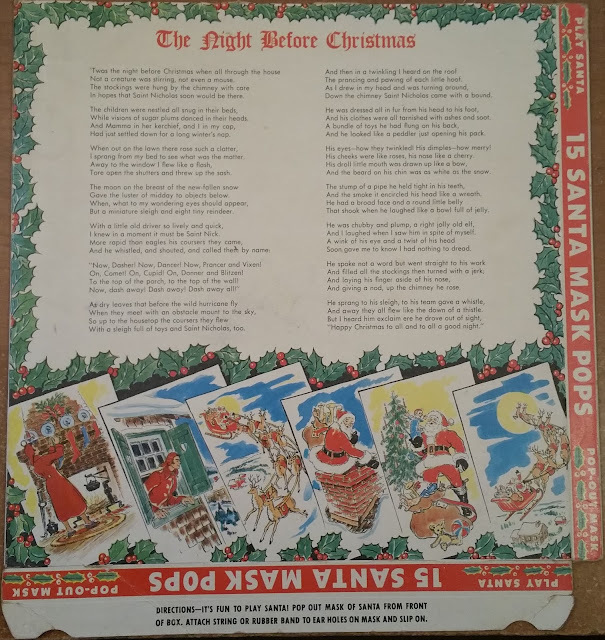 I'll not reprise all the Christmas items I've posted here over the years but will close with an item recently auctioned off by BFF o'the Archive Jeff Shepherd, dating from sometime in the 1970's. Behold! 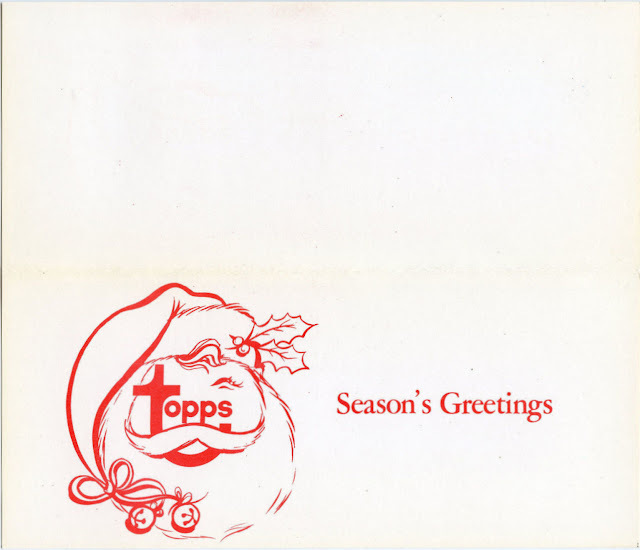 Topps has been a sporadic producer of albums during the course of their almost seventy year history of issuing cards. 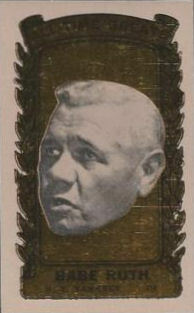 Their two small (about 4" x 5") Hocus Focus albums were issued in 1948-49 and designed to house a full 126 card series of the set commonly referred to as Magic Photo. Topps did a lot of bifurcating when it came to naming their gum and associated card sets back then, so Hocus Focus was the name of the gum. 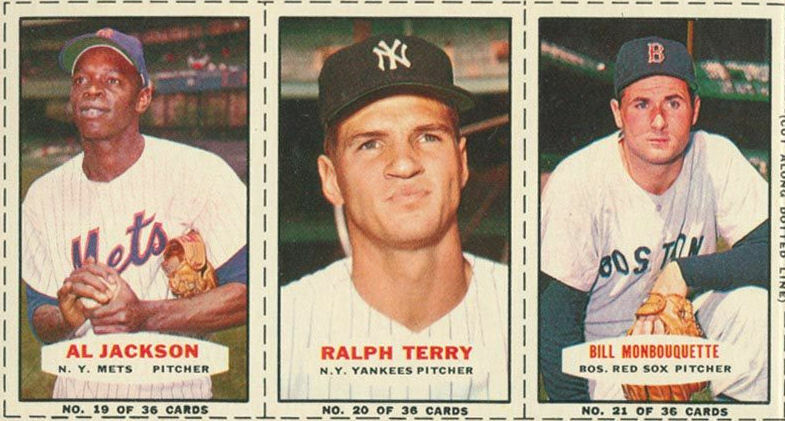 Little slits were made on pages of black paper to hold the cards in the pre-plastic days. 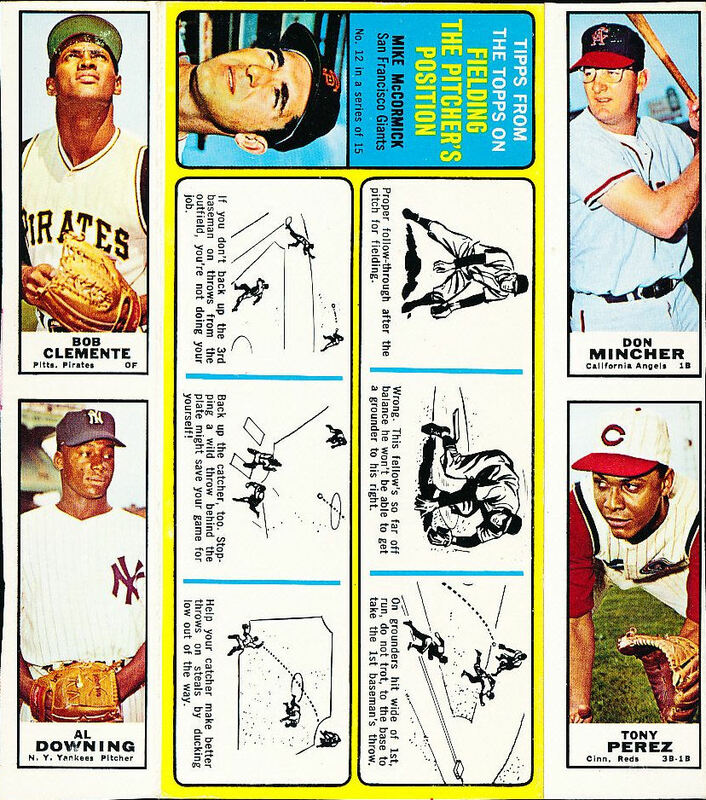 However, Topps did themselves one better when they came up with an album for the Pixie gum card set known as X-Ray Roundup. 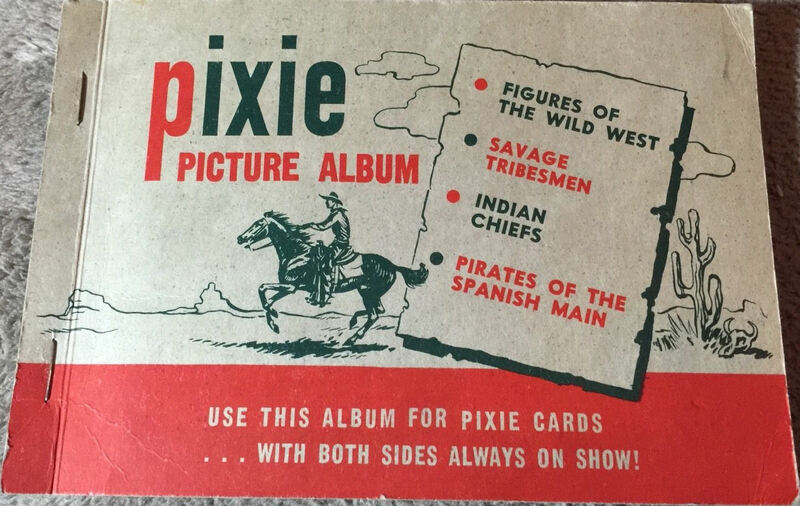 Thanks to a pickup of three Pixie albums over the summer by Friend o'the Archive Tom Boblitt, we can take a look-see at a very clever construct. Neat, huh?! Plastic pages have been around the hobby for almost 40 years now but before the late 70's it was paper all the way. The little peepholes allowed a partial glimpse of the x-ray! The back of the album is blank, the tape is a later addition I guess, maybe the original owners attempt to house the cello paper? 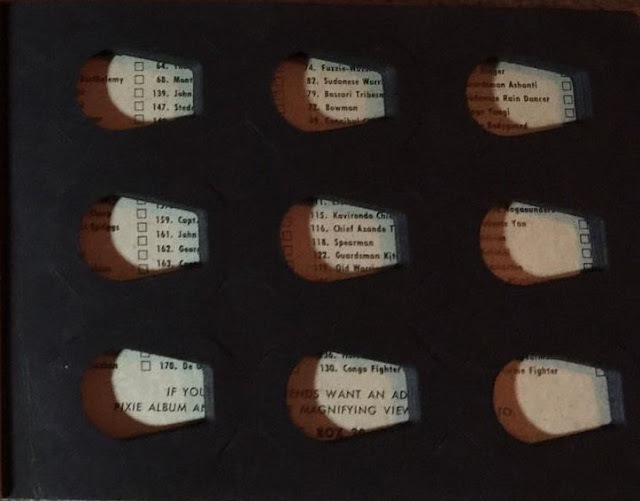 The staples were possible as the album only had nine pages (and only held 81 cards). 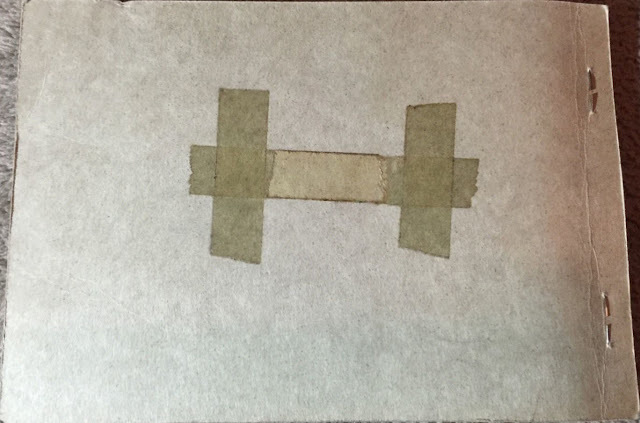 The earlier Hocus Focus album used brass fasteners. Considering vending boxes only had about 30 different subjects in a difficult collation and there were no nickel packs, I doubt more than a handful of folks put together a full set as a kid. Kudos to anyone who did! 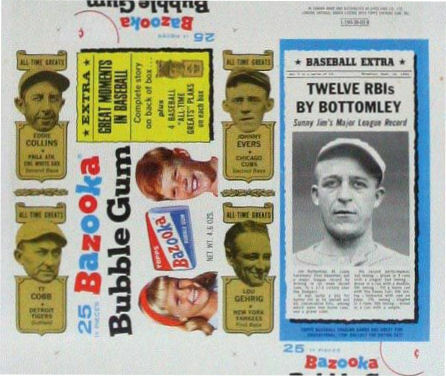 I thought I would do a deep checklist dive on the Bazooka Baseball sets today. 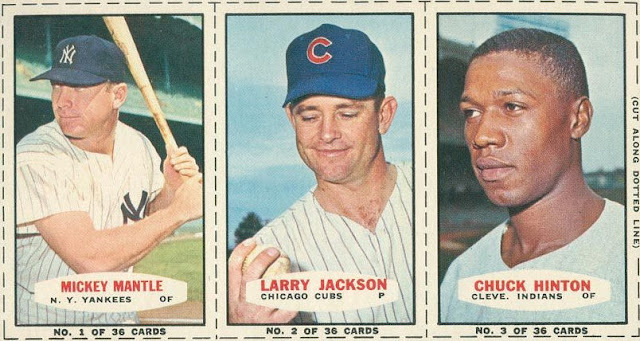 Anyone who collects vintage cards knows about them and I know all of my faithful readers do; I even wrote about them here about five years ago, although it wasn't meant to be an in-depth post. But it's hard to tell certain issues apart in the years covering 1960-67 and I can't swear I've seen an alphabetized list of all subjects anywhere that includes the 1964 Stamps. This may be a bit of a mess format-wise but so be it. 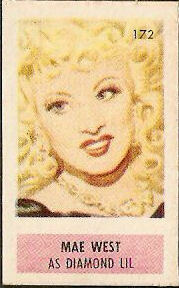 I'll post scans from each year first, then present an alphabetical checklist. 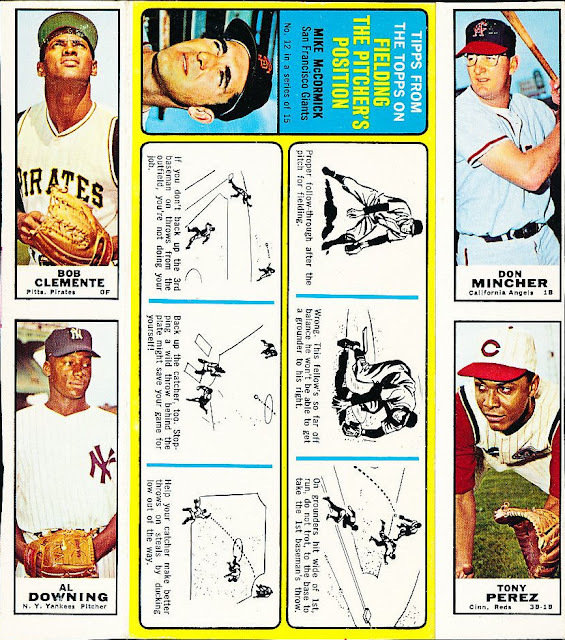 Finally, a chronological list is shown that details where each player appears on the three card panels (where appropriate) that make up the majority of the issues. There are 725 cards and stamps all told (counting the All Time Greats "silver front" cards from '63 and the proofs from 1971). 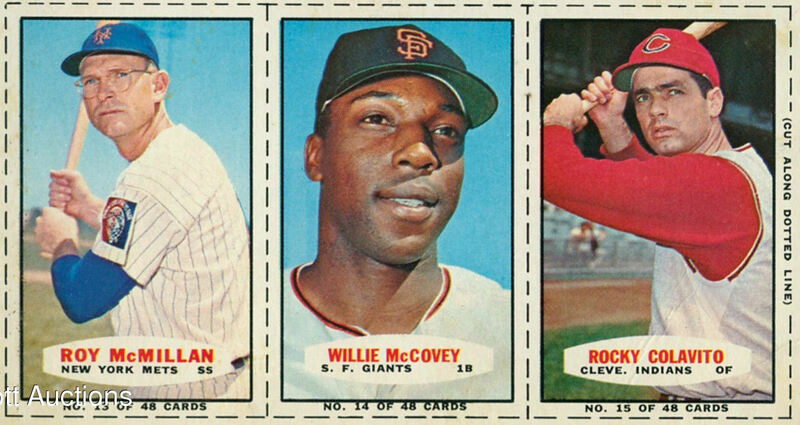 If I'm not mistaken, Willie Mays is the only player in all Bazooka sets that included current players. 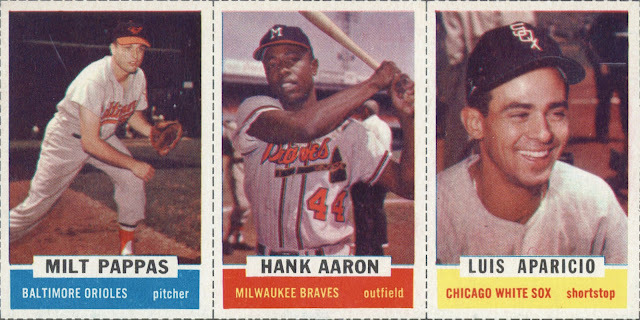 Hank Aaron did not have a card in 1961 or else he would also have touched 'em all. 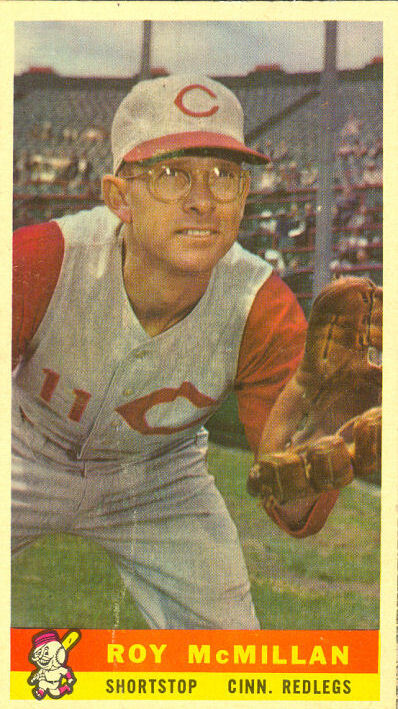 Mays holds that distinction in other runs of sets as well such as the 1967-68 Discs. 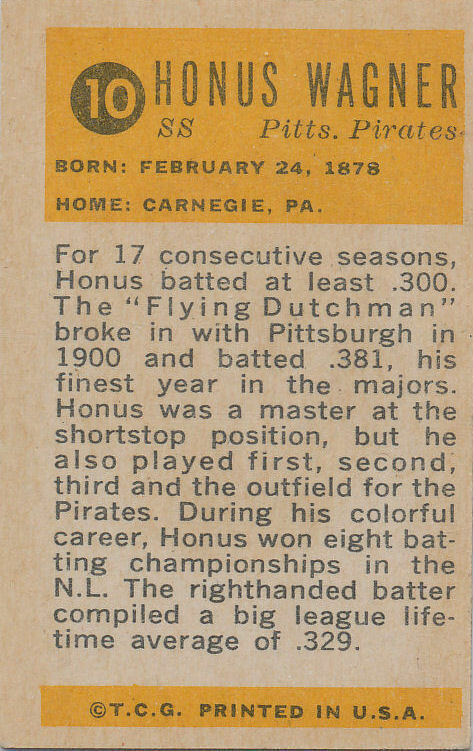 And a word about the 1969-71 issues. 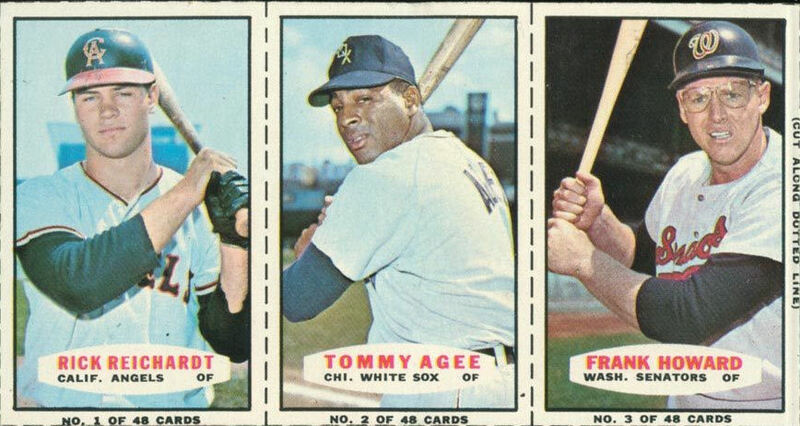 It's odd Topps repeated the All Time Greats 1969 design and subjects in 1970. There is a theory (not mine, but it's certainly plausible) that the numbered, 48 card "proof" set attributed to 1971 was intended to be the 1970 issue but for some reason it was withdrawn and the unnumbered, 36 card set was issued in '71 instead. Player selection in the "proof" set seems to bear this out. The only Bazooka set of current players issued in a large format that is probably one of the top five or ten sets of all time in design and composition. Too bad this style didn't continue. That one is mine. 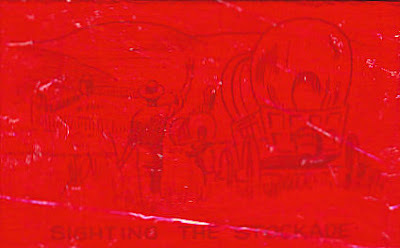 The next eight scans are mostly nicked from some old Huggins & Scott auctions; they have probably sold more complete Bazooka panels than any other auction house. There's good ole Roy McMillan again! Lost of obscured logos and capless shots this year due to AL expansion. 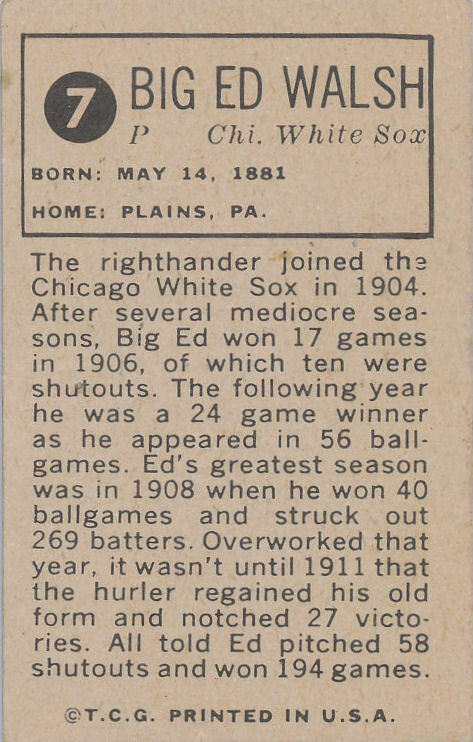 That scan is from my buddy Al's Love of The Game auction site. Five ATG's were found in each box! The photography for the stamp set is pretty nice! 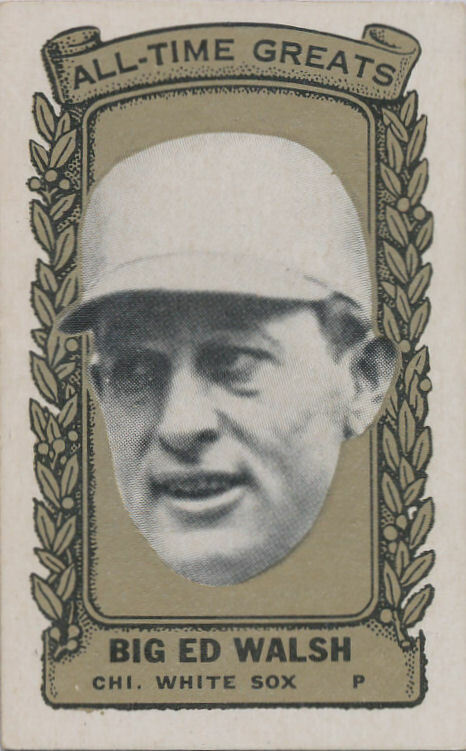 Sorry for the H&S partial watermark but I had to get another shot of McMillan in here with his Mets uni. Does this design look familiar? 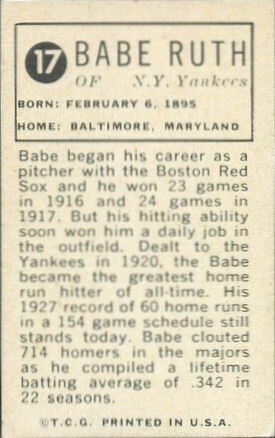 Note the increase to 48 cards. If those head shots look familiar, it;s because they were recycled too! I've never really been able to figure out the source of the numbered issue. It was clearly produced in numbers far exceeding any actual proof run but the launch into the hobby is still a secret I guess. 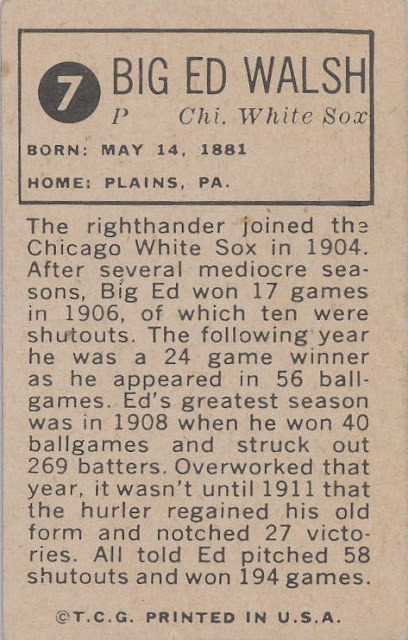 I'm sure it was through one of the usual conduits back in the day like Bill Haber or the Card Collectors Company but I've never seen anything specific. 1968 DRYSDALE DON NO .